Ask fellow campers about "Wapacoma" and nearby attractions. A great small town campground by the river. Nice beach area for sitting in a chair (it is stones, not sand), having little ones play in the water (you need shoes, it's river rocks), GREAT water for kayaking. You can also tube down the river if you wish. You can fish with a WV fishing license (purchase online). They have ice and ice cream for purchase at the office. A play area for kids (unshaded), basketball court, horseshoes. They have a pavilion with Wifi, we had wifi service (light) at our campsite. The bathhouse is decent, it is older but very very clean (cleaned twice a day, and done thoroughly). They also have a soda vending machine at the bathhouse. 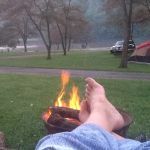 They have great riverfront lots (tents only), w/e and w/e/s hookups for campers (or tents if you want). My one complaint, they added sewer to several rows of sites, those sites are so sporadic and tight compared to many others. The odd number sites 53-95 are new to have sewer. However, the sewer hookups are in the MIDDLE of many of the lots. One spot had a random sewer hookup with no water or electric hookup?? They are MUCH tighter than the w/e sites (even number 52-94). The sites 0-24 are full hookup much better placed sewer hookup (next to the water and electric) but are much smaller than the even numbered w/e sites. So, think about what is most important to you when you are reserving. They have a free boat ramp, many other free boat ramps to drop off nearby. 3 dump stations. Fire pits and picnic tables at most sites. Well trimmed mature trees. Smooth gravel roads. Pet friendly but, they have signs many places indicating "no pit bulls". A great value for a weekend in the "country". Please note: They only accept check or cash, NO DEBIT OR CREDIT. We camped at Wapacoma in a Fifth Wheel. Small town of Romney (pharmacy, grocery store, bank, fast food) about 10-15 min away. Are you affiliated with Wapacoma ?